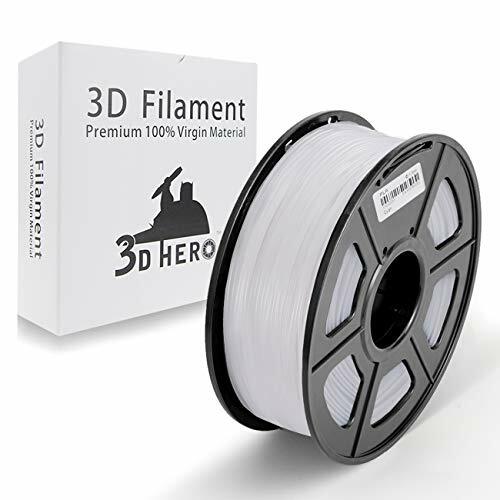 What's Good About 3D Hero 3D Printer Filament? 【+/-0.02mm Tolerance ONLY】Stable dimensional accuracy bring you smooth printing experince,no extruder nozzle blocked. ORDER NOW ? Get this Incredible PLA filament 1Kg Spool for 3D printers ? Delivery in Just 3-5 Days! ◆【Non Toxic & Low Odor】 Ideal materials for indoor printing, Eco-friendly & NO harm to user. All printer filaments have passed SGS,ISO,ROHS. ◆【White PLA 3D Filament】 High purity with Low shrinkage,High strenth with Better toughness,Ease of Use,No bubbles. ◆【Guarantee & Service】365 days warranty,Any quality problems about our 3D Printer Filament, we will replace you. If you have any questions about this product by 3D Hero, contact us by completing and submitting the form below. If you are looking for a specif part number, please include it with your message.